EVERYTHING in the neighbourhood settled back down to normal once Donald and Daisy had gone. Both Mum and Dad seemed to really chill out and Squeaky and his crew were happy and content once more, for they were no longer hassled at snack time. Yes, life at the hamburger stand really did return to the peacefulness that it was before – well…. for a short while anyway! If you are wondering what happened to Daisy, (pictured on the right) although I never knew when she actually flew the coup, she disappeared at around the same time as Donald did, so maybe she went with him and is up there now on top of the mountain range, completely ignoring him and his singing like she did while they were here on the balcony. Being female, I surmised that Mum had something to do with it, so maybe it was Mum that booted Daisy out of their tree house and she knew it would be a useless exercise flying down to the hamburger stand for one last snack. I guess Donald could have been forewarned of his impending dismissal when Daisy got the shunt, but just couldn’t resist one last quack for another bite of hamburger… and the faint hope of course that Dad would relent and let him stay. 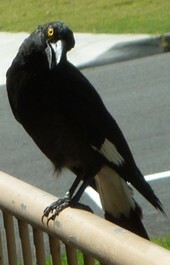 Months later a magpie flew in from the trees where it had apparently been watching us for a time and landed on the balcony railing. 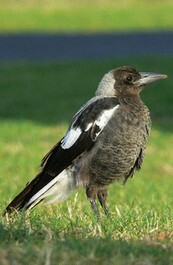 It looked slightly familiar, although it was a fully grown bird, it still had the grey feathers of a juvenile. It seemed to know me and the ‘Old Bird’ next door, it had a bite or two of hamburger and appeared to know it’s way around, which finally convinced me that I knew who it was, but it’s presence was only fleeting for just then, Mum arrived for a snack, saw the intruder and with alacrity, gave it the old heave-ho. The visitor was never seen again. I suspect that it was Daisy hoping to stay for awhile, or become a regular diner once again. Maybe Donald sent her to see if the coast was clear for both of them to return, but alas, that was not to be. Mum and Dad were definitely not welcoming any guests in their territory. Around about that time, another visitor arrived on the scene. This bird was timid and watched intently from afar as the regular birds were fed. It got a taste of hamburger when I tossed it far enough away to be retrieved with safety. We were to get to know it very well in the times ahead. The bird was a female currawong (pictured to the left, sitting on the railing after she got used to the hamburger stand) that later on was named ‘Elvira’ because of her mysterious yellow eyes and black feathers, a bit like a witch. It turned out eventually that she wasn’t to be a problem in the neighbourhood – it was her crazy schizophrenic boyfriend that was to become a problem and cause havoc for the rest of the birds…and me. But I jump ahead of myself – before the peace was ruined, we have to meet the Bruces…and the poltergeist…. Posted on October 3, 2011, in Natures Pecking Order and tagged Mother Nature, Wild Things. Bookmark the permalink. Leave a comment.